On the way to a more sustainable society, transport needs to be urgently optimized regarding energy consumption and pollution control. While in earlier decades, Europe followed automobile technology leaps initiated in the USA, it has decoupled itself for 20 years by focusing research capacity towards the diesel powertrain. The resulting technology shift has led to some 45 million extra diesel cars in Europe. Its outcome in terms of health and environmental effects will be investigated below. Expected greenhouse gas savings initiated by the shift to diesel cars have been overestimated. Only about one tenth of overall energy efficiency improvements of passenger cars can be attributed to it. These minor savings are on the other hand overcompensated by a significant increase of supply chain CO2 emissions and extensive black carbon emissions of diesel cars without particulate filter. We conclude that the European diesel car boom did not cool down the atmosphere. Moreover, toxic NO x emissions of diesel cars have been underestimated up to 20-fold in officially announced data. The voluntary agreement signed in 1998 between the European Automobile industry and the European Commission envisaging to reduce CO2 emissions has been identified as elementary for the ensuing European diesel car boom. Four factors have been quantified in order to explain very different dieselization rates across Europe: impact of national car/supplier industry, ecological modernization, fuel tourism and corporatist political governance. By comparing the European diesel strategy to the Japanese petrol-hybrid avenue, it becomes clear that a different road would have both more effectively reduced CO2 emissions and pollutants. Europe's car fleets have been persistently transformed from being petrol-driven to diesel-driven over the last 20 years. This paper investigates on how this came to be and why Europe took a distinct route as compared to other parts of the world. It also attempts to evaluate the outcome of stated goals of this transformation which was primarily a robust reduction in GHG emissions. We conclude that global warming has been negatively affected, and air pollution has become alarming in many European locations. More progressive development scenarios could have prevented these outcomes. By 2007, the share of energy demand for transport purposes made up 28.7% of final delivered energy on a global scale. Worldwide transport was responsible for 23% of world energy-related greenhouse gas (GHG) emissions with road traffic representing 74% of this sector (IPCC data from 2007, as summarized in). The transport sector includes airplanes, ships, trains and all types of street vehicles (e.g. trucks, busses, cars, two-wheelers). Vehicles sometimes are also separated into light-duty vehicles (automobiles, motorcycles, light trucks) with a kerb weight of up to 3,850 kg and the class of heavy-duty vehicles. In a business-as-usual scenario, a further doubling of automobile CO2 emissions is to be expected by 2050 due to the enormous increase in automobile use in the developing world (particularly Asia, see). Improving fuel efficiency by 50% could however stabilize world automobile CO2 emissions by 2050. Strategically as well as environmentally, automobiles play a particular role due to several reasons: first, cars dominate road traffic in most countries. Eighty million motor vehicles were produced in 2008 worldwide, 60 million of these being cars; second, car sales exhibit the largest growth rates in the world (see below); third, unlike for trucks, the automobile market offers various propulsion technologies as well as carbon-based fuels; fourth, besides the climate-relevant CO2 emissions, toxic emissions of cars negatively affect the air quality in many regions, predominantly, those of the world's densely populated. The World Health Organization (WHO) identified particulate matter (PM), nitrogen oxides (NO2), ozone and sulphur dioxide (SO2) as being the most dangerous air contaminants causing 1.3 million premature deaths per year due to urban outdoor air pollution. However, PM (by number) and NO x emissions as well as ozone production are largely caused by traffic emissions. Following all that, it is essential to optimize automobiles with respect to fuel efficiency, fuel type and emissions. Astonishingly, these challenges are addressed in very different ways: Europe strongly favours diesel-type combustion cars, while diesel cars in USA are a side issue only. 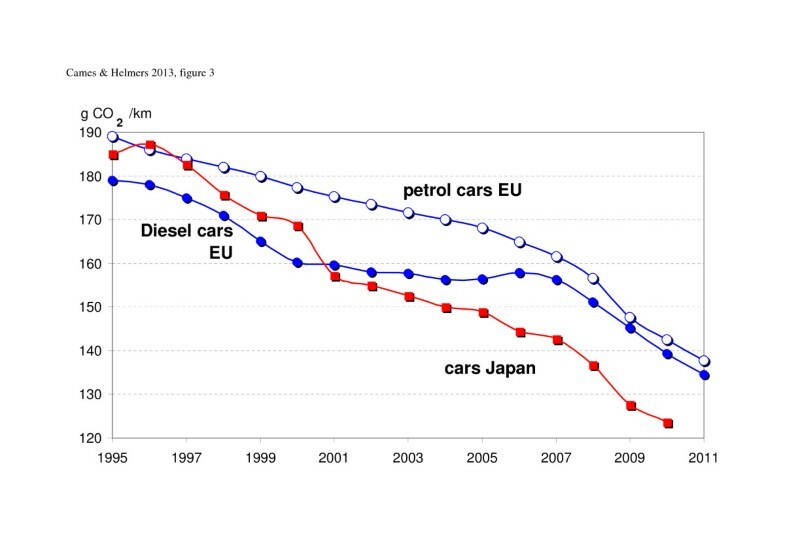 More astonishingly, while since the late 1990s, the European diesel car market boomed, diesel vehicles were removed from the Japanese market. Possible backgrounds and effects of these oppositional strategies will be discussed in this paper. Also, the European diesel car boom constitutes a profound technology change. Presently, another automobile technology change is being planned for the near future: several western states and China seek to introduce electric cars on large scale, which are much more energy efficient and have local zero emissions. Experiences in successfully ‘dieselizing’ car markets may help to launch electric cars. The European Union (EU), USA and Japan own the world's biggest car fleets (Table 1). Within the EU, Germany (over 40 million) hosts most cars (Table 1), followed by Italy (36 million) and France (31 million), the UK and Italy (figures as of 2008,). A fleet of altogether 530 million cars are to be found on the eight biggest car markets including as well Russia, China, Brazil, South Korea and India (, data as of 2008). According to the IPCC, the number of vehicles may double until 2030 and triple by 2050 amounting to 2 billion light-duty vehicles worldwide. Over the past ten years, China witnessed the largest annual car fleet growth up to 23%, followed by India (13%). In 2011, 60 million new cars were manufactured worldwide according to ACEA and annual vehicle production is believed to grow by 3% per annum until 2030. Sixty-five million vehicles were produced in 2010 while worldwide production is expected to be 93 million in 2020 and 114 million in 2030. To date, the largest markets and fleets are to be found in the EU, USA and China (Table 1). All in all, the EU, USA and Japan dominate car markets worldwide and own the largest car fleets, with China following suit (third biggest market in 2011). Automobile production is spread more widely (Table 1). However, as for turnover (2008) and production (2010) figures, the world's 15 largest car manufacturers are all situated in Europe, USA or Japan. Accordingly, EU, US and Japanese development of automobile technology as well as emission standards continue to dominate worldwide automobile standards, car production and fleet development. For example, Asian countries widely adopt EU automobile emission standards however with considerable time lag. European cars exported to emerging markets have to comply with much weaker emission standards than those established in Europe. The European diesel car boom needs to be considered in this context as well. In the early 1990s, the ratio of diesel cars in both Europe and Japan did not differ much and accounted to about 10% of the fleet (Figure 1). It further increased until the mid of the decade. Since then, the development completely diverged. 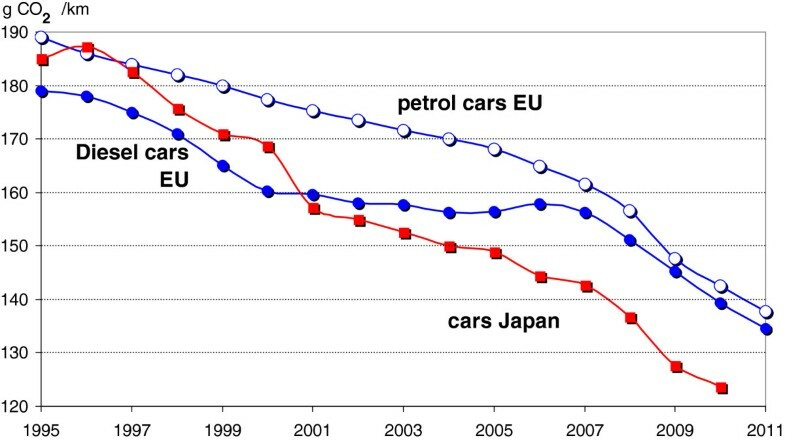 Japan began to phase out diesel cars while at the same time EU diesel car registrations began to take off and grew steadily. Only the influence of the economic crisis in 2008/2009 disturbed this longstanding increase in Europe when gradually smaller and significantly less diesel-driven cars were purchased (e.g. in Germany, a temporary scrappage bonus strongly promoted small car sales). 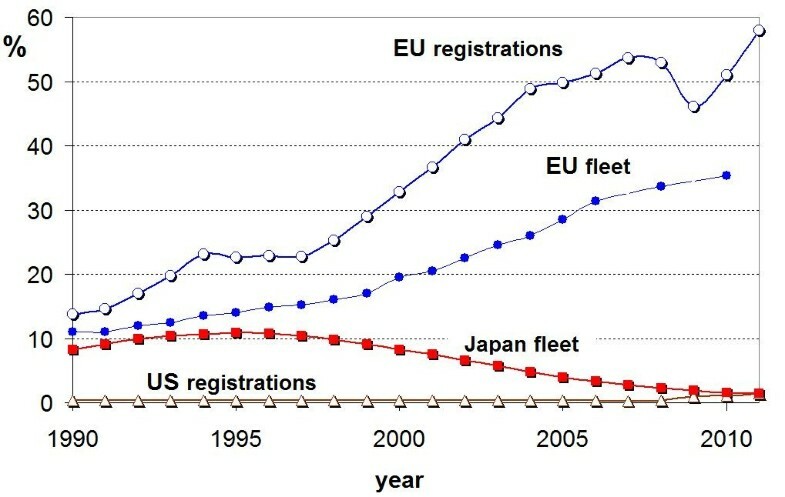 At that time, diesel car fleet ratios amounted to 1.4% in Japan compared to 35.3% in Europe (2010), respectively, 58% as for new registrations (2011) (Figure 1). Diesel car penetration in major world markets. Expressed as percentages, either annual new car registrations or annual entire car fleet composition. Data sources: EU registration data[5, 13]; data 1990 to 1993 (Western Europe, including Iceland, Norway, Switzerland); data 1994 to 2011 (EU-15); EU fleet data for 2006, 2008 and 2010 (ACEA, http://www.acea.be); EU fleet data 1990 to 2005; Japan fleet data; US registration data 2000 to 2011 (, data extrapolated back to 1990). We assume that the long-term diesel car share in Europe would have stabilized at around 15% since the mid 1990s without incisive interventions by the European Commission to promote diesel cars (e.g. diesel car emission concessions), Member State tax advantages to support diesel car sales and provisions taken by the European car industry. Asserted interventions are being discussed below. These days, 238.8 million cars are registered in EU-27 (figures as of 2011,). The increase of dieselization from a ‘non-interventionist scenario’ figure of 15% to 35.5% as calculated for the EU-15 results in about 45 million extra on-road diesel cars as compared to the mid 1990s. Provided a different political course would have been taken, these diesel-fuelled cars could have run on petrol or equipped with alternative powertrains such as petrol-electric hybrids like in Japan, as discussed below. As for the territory covered by the European Environmental Agency (30 European countries, including Turkey), the share of diesel cars among the entire fleet increased from 14.2% in 1995 to 33.2% in 2009 which amounts to an extra 46.95 million diesel cars in absolute terms. These extra diesel cars impact air pollution levels for a long time: \the average life span of a 1990-built car in Western Europe has been reported to be 16.1 years. We will raise the question whether European diesel technology or Japanese petrol hybridization have been environmentally more efficient and what have been the reasons for this very different development. Interestingly enough, the level of diesel car penetration is far from uniform within Europe (Figure 2). 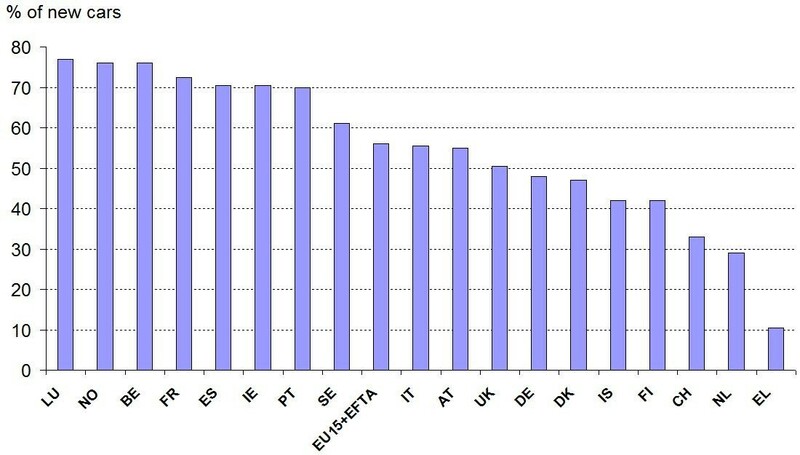 Diesel penetration by country in EU-15 plus EFTA (in %) of new cars registered by 2011 . NO, Norway; CH, Switzerland; IS, Iceland; IE, Ireland; EL, Greece. 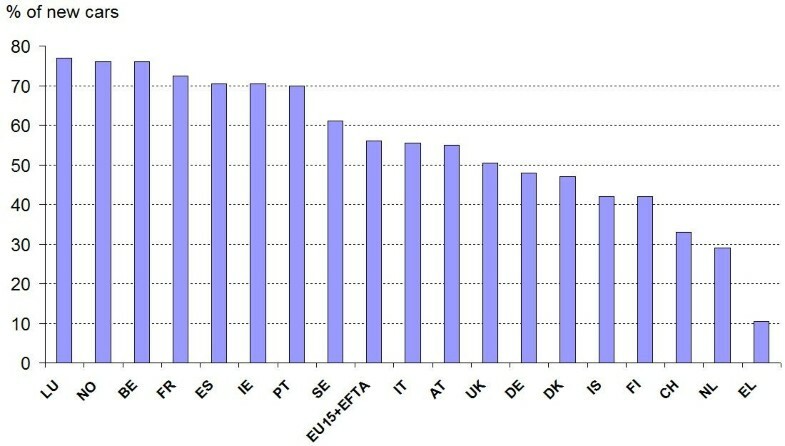 While the overall EU diesel car penetration follows the trend shown in Figure 1, the ratio of diesel cars remained very low in some European countries (Figure 2). Also, dieselization developed heterogeneously over time in different countries. The fastest dieselization increase occurred in Italy where the share of diesel cars quadrupled between 1995 and 2009 (Figure 3). This is to be discussed to understand underlying political and economic mechanisms, as we will see below. Dieselization in 1995 (blue columns) and 2009 (purple columns) according to EEA . Percentage of diesel cars in the total passenger car fleet. Threshold exceedances (in %, red) according to the Gothenburg protocol for NOx emissions in 2010. The USA and China are two further world-leading car markets (Table 1). In the USA, as a response to the 1973 and 1979 oil crises, several hundred-thousand diesel cars were sold. However, from the 1980s onwards, diesel cars became marginalized, and its market share later shrank to some 0.3% in the early 2000s. Since 2008, again, diesel car sales achieve double-digit growth in the USA reaching 1.3% market share in 2011. Analysts believe it could grow to 6% by 2015. Within the world's largest car markets, China has the lowest diesel car ratio with only 0.04% of new registrations in 2005. India, the next-fastest growing car market on the contrary exhibits a registration share of 35%. The UN Intergovernmental Panel on Climate Change (IPCC) was established in 1988. Its creation may be considered as the beginning of a global political commitment to combat the threat of climate change. The political efforts of the 1990s years resulted in the Kyoto protocol adopted in 1997, where particularly European countries committed themselves to significant reductions of GHG emissions. The European Union signed the Kyoto protocol with the commitment to save 8% GHG by 2012. During the elaboration of the target, the European Commission devised an allocation plan of the envisaged savings. Traffic and particularly road traffic had early been identified as one of the main GHG emission sources (see above). However, since heavy-duty vehicles (trucks) are propelled by diesel engines with hardly any alternative (despite busses and local heavy-duty traffic), the automobile sector has been identified early as the sector in which a technology shift from gasoline to diesel engines may ensure significant GHG savings. GHG emitted by automobiles are expressed in CO2 equivalents, which are usually quantified by summarizing the three GHG CO2, CH4 and N2O emitted by fuel provision and combustion. However, CH4- plus N2O-related CO2 equivalents amount to less than 2% of CO2 emissions. The European Environmental Agency (EEA) considers only one parameter of both CH4 and N2O in calculating the CO2 equivalents of road transport diesel oil and gasoline fuel, respectively, resulting in only around 1% deviation of CO2 emissions. Direct CO2 passenger-car emissions may thus be considered here since they equal GHG emissions with a low error rate. Generally, diesel cars are believed to be (much) more fuel efficient compared to their gasoline alternative. In its fourth assessment report, IPCC announced an outstanding 25% well-to-wheel CO2 emission advantage of a diesel car compared to its petrol equivalent. According to the report, ‘Direct injection diesel engines yield about 35% greater fuel economy than conventional gasoline engines’, enhancing thereby the market value of diesel cars. The US federal office of transportation quantifies the fuel economy advantage of diesel cars over gasoline cars as up to 63%. All too often, however, the higher calorific value of diesel fuel is not taken into account. Diesel fuel contains, dependent to fuel quality, about 14% more carbon per litre. This effect reduces the CO2 emission advantage of diesel cars suggested by favourable fuel efficiency measured in volumetric terms (l/100 km or miles gal−1). Thus, the emission intensity (in g CO2 km−1) is a much more precise indicator to measure the efficiency of fuels with competing engine technologies than the fuel consumption efficiency. Lutsey compared the fuel economy increase as well as the CO2 emission reduction advantage of 23 different electric hybrid gasoline cars and 16 diesel cars to their gasoline model equivalents. On average, the hybrid models offered a 45% fuel efficiency advantage and 30% CO2 savings whereas diesel models only brought about a 35% fuel efficiency advantage and 15% CO2 savings during operation. Also, Schipper and Fulton conclude that the diesel car CO2 ‘advantage appears to be no more than 15% to 18% for vehicles of similar size class’. Diesel car engines have been tremendously improved over the last 2 decades: the diesel engine with direct injection has been introduced, fuel pressure has been continuously increased by common rail direct fuel injection and turbo charging has become common in modern passenger car diesel engines. Fuel economy of diesel cars has been improved considerably by these measures. However, the much higher diesel fuel injection pressure continuously increased NO x emissions (see below), whereas soot emissions were decreased - but only by weight. Without post-treatment, however, the remaining soot is composed of much smaller particles. In contrast, the advancement of the petrol-fuelled engine has received considerably less attention during the past 20 years. For example, there were a few automakers only early offering cars with downsized turbocharged petrol-fuelled engines like Mitsubishi and Volkswagen. Just recently, other automobile manufacturers have marketed downsized petrol engines. We believe that the CO2 advantage of petrol cars would have been nearly or about the same if the same effort had been invested in improving petrol engines. This can be illustrated with two examples: in 2009, a Volkswagen, model ‘Passat’ with turbocharged downsized petrol engine (110 kW) emitted 157 g CO2 km−1, while its pendant ‘Passat’ with 105-kW-diesel engine emitted only 3% less, i.e. 152 g CO2 km−1. Fuelled by natural gas; however, the ‘Passat’ with the same performance engine emitted only 119 g CO2 km−1. Another case in point, a Ford, model ‘Focus’, with modern turbocharged downsized petrol engine (1.0 l, 3-cyclinder, 73.5 kW) emits 112 g CO2 km−1 while the pendant car with 70 kW turbocharged diesel engine emits 109 g CO2 km−1, not even 3% less (according to Ford data). We conclude that CO2 emission advantages of diesel cars can be close to absent if gauged against modernized petrol-driven engines. While the former chapter discussed whether there is a fundamental efficiency, i.e. GHG emission advantages of diesel cars versus petrol-fuelled cars, on-road CO2 emissions of new passenger cars are analyzed subsequently. Between 1995 and 2005, a significant emission gap of 5% to 10% CO2 persisted in Europe between newly registered diesel and petrol cars (Figure 4). However, while petrol-fuelled cars emitted continuously less CO2 over time, diesel cars in Europe stalled emission intensity improvements between 2000 and 2005. New diesel passenger cars in Europe therefore lost most of their CO2 emission advantage over gasoline cars (Figure 4). Since 2009, diesel car CO2 emission advantage over petrol cars in Europe became marginal and went down to 1.5% in 2010 (Figure 4). Since 2006, CO2 emissions of new diesel cars in Germany even continuously increased as compared to gasoline cars. CO2 emissions of new diesel cars registered in Germany had increased since 2001 while at the same time gasoline cars lowered their CO2-emission intensity. A continuous increase of engine power has been one reason. CO2 emissions are clearly increasing with growing engine power. Engine power of new passenger cars in Europe grew continuously in the past. However, while engine power of gasoline cars grew only by 7.5% between 2001 and 2011 among new cars in Europe, diesel car engine power increased by 22% in the same period. By 2011, new diesel passenger car engines were 21% more powerful than gasoline cars in Europe. Some authors have pointed in this context to the rebound effect[25, 37, 38]. In conclusion, the EU Commission's thrust to boost diesel car technology with the aim of reducing overall CO2 emissions has failed by mismanagement. Based on comparable data as shown in Figure 4, Ajanovic argues that ‘the largest part of saving over time was brought about by overall efficiency improvements for both gasoline and diesel cars. Due to better efficiency of cars in general, between 1980 and 2007, about 9% of energy was saved of which about an eighth - 1% - was saved due to the switch to diesel. Given this very moderate result, we can conclude that the fuel tax incentives provided of about 10% to 50% lower taxes in different European countries for diesel than for gasoline were not at all justified’. At the same time, Japan managed to decrease CO2 emissions of new cars much faster (Figure 4) without resorting to diesel technology. By increasing the hybrid car market share in Japan continuously from 0.4% in 2001 to 9.3% in 2010 (numbers calculated with data from http://www.greencarcongress.com/sales and JAMA data[31, 32]), Japanese CO2 car emissions declined noticeably since 2001 (Figure 4). In 2010, 1.4 million hybrid cars circulated on Japanese roads, amounting to 2.4% of the whole car fleet. In the USA, Canada and Australia, car CO2 emissions are much higher than in the EU and Japan as a consequence of larger average car size. Tank-to-wheel CO2 emissions as discussed above are nonetheless only one side of the coin. Supply chain fuel emissions are in the order of 18% of aggregate well-to-wheel emissions (, based on). Öko-Institut quantifies petrol-provisioned CO2 emissions as being 7% higher than for diesel. Bodek and Heywood assert the opposite: well-to-tank emissions of diesel fuel provision are 13.6% higher than for petrol followed by another 7% CO2 emission surcharge of diesel over petrol in the tank-to-wheel phase (according to CONCAWE 2007 data). Supply chain CO2 emissions are greatly depending on the source and type of crude oil, the refinery location and transport distances. In addition, they are in continuous flux: Pieprzyk et al. claimed that the mean diesel and petrol GHG emissions are 347.5 g CO2 kWh−1 and therefore on average 15% higher than indicated by Global Emission Model of Integrated Systems 4.5 (GEMIS, see http://www.gemis.de). The consistently increasing diesel fuel demand in Europe has considerably increased supply chain emissions: diesel fuel supplies from Russia have gradually supplanted EU production ensuing in higher supply chain emissions. According to Pieprzyk et al., additional CO2 emissions amount to some 25% as for Russian compared to mean German diesel fuel. Moreover, the European Petroleum Industry Association (EUROPIA) believes that new environmental regulations to reduce the sulphur content of fuels could lead to a 50% increase in CO2 emissions. Dings points out that the high demand for diesel fuel resulting in a sharp increase of the middle distillate/gasoline production ratio from 1.7 to 3.7 will increase the CO2 emissions from 0.18 to 0.29 t/t product (+61%). Hydrocracking units necessary for this production shift in order to maximize distillate fuel output is the case in point. EUROPIA anticipates that despite assumed efficiency improvements, the higher demand and enacted or potential increased product quality specifications will substantially increase refinery CO2 emissions by 2020. Should the observed historic growth of diesel demand in Europe continue, diesel market dynamics would result in refinery-CO2-emission penalties eventually exceeding diesel vehicle benefits. As yet, the ‘new European driving cycle’ (NEDC) has been applied to quantify fuel consumption and GHG emissions under standardized but artificial test cycle conditions. It has become common understanding however that the test cycle is unable to represent real-life driving. Almost all cars consume some 20% to 25% extra fuel than NEDC estimates and as a result emit more CO2 than certified. Most of the 100 cars investigated by auto-testers exceeded test values by up to 40%, while a few percent of the vehicles in this spot check revealed fuel consumptions even up to 70% higher than certified, according to the European test scheme. What is more, diesel cars have been reported to show higher deviations from test cycle results than gasoline cars (reviewed in). In a recent study published by the European car magazine AutoBild (German Edition no. 23, June 8, 2012), real life fuel consumption deviations of 19 diesel cars and 32 gasoline cars have been analyzed. Diesel cars revealed surplus consumption of +39% while gasoline cars merely consumed +30% more fuel on average compared to NEDC (plug-in hybrids were not considered). It must be said however that the car classes chosen such as SUVs, vans, green or sportive cars generally exhibit the highest deviations from certified fuel consumption. According to a real life assessment of 250 cars by the German automobile club ACE between 2000 and 2008, petrol cars recorded an average surplus fuel consumption of 16.9% while diesel cars consumed 23.8% more. With regard to the above reasoning, we ultimately believe that the European diesel car boom permitted only small CO2 savings from a book-keeping point of view, yet it might have saved none at all or even boosted aggregate CO2 emissions. Beyond the previously mentioned greenhouse active species (CO2, N2O, CH4) there are two more important traffic-related warming agents emitted or induced by road traffic: ozone and black carbon. Nevertheless, EEA calls PM (particulate matter) and ozone as being just ‘the most problematic pollutants in terms of harm to health’. Annual mean ozone concentrations in Europe have been reported to be fairly constant since measurements have begun in 1997. However, ozone is produced from the precursor groups VOC (volatile organic carbons), CO and NO x . The latter is emitted by traffic and particularly by diesel engines (see below). EEA reports that ozone concentrations remain stable at a high level even that precursor emissions have decreased considerably. However, reported precursor emissions are only modelled and may not reflect reality (see below). Radiative forcing by tropospheric ozone has been quantified by IPCC as being +0.35 ± 0.15 W·m−2, which is 21.9% of the net positive radiative forcing effect of all-human activities since 1750. Nevertheless, EEA does not quantify the excess radiative effect of ozone immission in Europe according to their anthropogenic precursor emissions. The reason not to do so is its lack of commitment: both ozone and black carbon are not covered by United Nations Framework Convention on Climate Change and Kyoto protocols. Modelling ozone dynamics with respect to their precursor groups is difficult. In the USA, atmospheric researcher Jacobson runs suitable models exhibiting, e.g. a widespread ozone increase in consequence of excess CO2 emissions. A reduction of ozone is most efficiently achieved by reducing its precursor group, the nitric oxides. However, particularly NO2 triggers excess ozone production and the NO/NO2 ratio decreased by oxidation catalysts in modern diesel cars of recent years (e.g.). Lemaire points to a high positive correlation of NO2 and ozone in European-polluted environments. The biggest concern with regard to the effect of the European diesel car boom towards the heat balance of the atmosphere is however related to excess black carbon (BC) emissions of diesel cars. Jacobson estimates the anthropogenic black carbon direct forcing to be higher than estimated by IPCC and summing up to +0.55 W·m−2. According to Jacobson, it makes up 16% of the total anthropogenic global warming. A joint group of experts presently assisting IPCC in the preparation of the forthcoming report concluded that in the industrial era (1750 to 2005), direct radiative forcing of atmospheric black carbon would be twice as high than previously believed (+0.71 W·m−2,). Jacobson and his group modelled the atmospheric effect of a theoretical conversion of the entire US car fleet from gasoline to diesel. They based their calculations on the strictest EU emission thresholds (EU 5 and 6) with 5 mg of PM km−1 and European-type cars. Jacobson concludes that ‘finally, even with a particle trap, diesel vehicles still emit more particles than do gasoline vehicles’ (Jacobson did not consider recent direct injection petrol-fuelled engines). Actually, EU regulations do not require cars to be equipped with particulate filters but PM must not exceed 5 mg·km−1. A diesel car equipped with particulate filter emits 1 to 5 mg PM km−1. Jacobson concludes that given a (realistic) 15% higher diesel car fuel efficiency as compared to petrol-fuelled cars, no cooling effect will be observed in the atmosphere over 100 years. Given an (unrealistic) 30% higher fuel efficiency of diesel cars, Jacobson predicts a warming of the atmosphere within the first 10 years, followed by an overall cooling, based on less than 6 mg PM km−1 of a single car. Black carbon is a strong warming agent expressed by its global warming potential (GWP): For fossil fuel emissions, Jacobson quantifies a mean BC-GWP of 1,870 for the 100-year horizon and a GWP of 4,470 for the 20-year horizon, respectively. Bond and Sun calculated a BC-GWP of 680 for the 100-year horizon and a GWP of 2,200 for the 20-year horizon. A GWP of 680 means that ‘1 kg of BC produces as much forcing as 680 kg of CO2’. BC is an impressive warmer because it absorbs most of the intercepted visible light whereas the impact of CO2 occurs over a limited range of infrared wavelengths. Due to its much shorter atmospheric lifetime in comparison to CO2, it is more efficient to reduce BC emissions in order to cool down the atmosphere quickly concomitantly reducing global outdoor air pollution. With these data, CO2-equivalent radiative effects of BC can be calculated: diesel PM contains 50% to 80% carbon. Andreas Mayer specifies 58% BC in diesel PM emissions, resulting in a mean of 61.5% if aggregated with NREL figures. The BC content of petrol combustion emissions is much lower with only 20%, which has been confirmed by US-EPA. Based on a mean 100-year GWP (averaged according to Jacobson and Sond and Sun, see above) of 1,275 and 61.5% BC emitted within diesel PM, an emission of 1 mg PM as achievable by particulate filters, would result in a CO2-equivalent of 0.78 g·km−1 due to its radiative effect. The most stringent PM thresholds (Euro 5, Euro 6), however, allow 5 mg PM km−1 emission resulting in a radiative effect of 3.9 g CO2 equivalents km−1. However, prior to Euro 5 standards mandatory since 2009, the European Commission allowed diesel cars to emit 25 mg PM km−1 emission according to Euro 4. This corresponds to 19.5 g of CO2 emissions, which is largely exceeding the maximum pre-2007 CO2 emission advantage new diesel cars possessed over petrol cars (Figure 4). Prior to 2005, the Euro 3 threshold was at 50 mg PM km−1 resulting in a CO2 equivalent of 39.2 g CO2 km−1. However, the diesel car boom in Europe already took off in 1997. Black carbon's global warming potential relative to a 20-year time frame is equivalent to the 2.6-fold potential relative to a 100-year time frame. Petrol car PM emissions were not regulated before Euro 5 (then limited to 5 mg·km−1), yet they were generally in the range of 5 mg·km−1 as shown, e.g. on a 2001 model car. This quantity of PM emitted by a petrol car corresponds to a radiative effect in the order of 1.3 g CO2 equivalents km−1 only due the much lower BC content of the emitted PM. It has to be emphasized that the above-generated radiative effects of emitted black carbon have to be added to CO2 fuel combustion emissions. In conclusion, millions of diesel passenger cars were allowed by EU authorities to be brought onto European roads after 1996 (Euro 3 allowing 100 mg PM km−1) emitting up to 20 times more PM as well as up to 60 times more BC compared to petrol cars (European Union automobile emission thresholds available here: http://www.dieselnet.com/standards/eu/ld.php). On a voluntary basis and to get hold of the first-mover advantage, Peugeot Citroën (PSA; French) equipped some of its new cars with particulate filters in 1999. After several years of public pressure debate about its necessity, car makers have followed suit since 2003 and equipped most of their diesel vehicles with particulate filters yet often at an extra charge. Figures about the share of diesel cars within the fleet equipped with particulate filters have not been recorded. However, since the European diesel car boom started already before the millennium and only after 2009, almost all cars became equipped with filters ex works is rather unlikely that a majority of diesel cars own a filter so far. A small share of pre-2009 diesel cars has been retrofitted with an unregulated, open, and inefficient filter system. Did the European diesel car boom mitigate climate change? A quantitative assessment of the climate impact of the European diesel car boom would necessitate a complex computer modelling, yet even basic variables, such as the number of diesel cars equipped with particulate filters for each individual year starting 1999 is not available. Some qualitative estimations however reveal a rather clear picture: the CO2 emission advantage of diesel cars as compared to petrol cars between 1995 and 2003 based on standardized measurements mounts up to 12.8 g km−1 (range: 8 to 17.1) (Figure 4). However, when taking account of black carbon emissions, the picture changes: diesel cars were allowed to emit up to 50 mg PM km−1 prior to 2005 (Euro 3). Average black carbon contained in the emitted PM of a diesel car registered between 1995 and 2003 has an excess radiative effect equivalent to 37.9 g CO2 km−1 relative to a petrol-fuelled car. These extra emissions of pre-2003 diesel cars are threefold the relative advantage of diesel to petrol cars (12.8 g CO2 km−1) between 1995 and 2003 when it comes to direct CO2 emissions. When, however, equipped with a particulate filter, the extra radiative warming effect of a mean diesel-fuelled car turns into a minor additional diesel car advantage relative to a petrol-fuelled car of about 0.5 g CO2 equivalents km−1, based on a simplified estimate here (elevated PM emissions of petrol-fuelled cars with direct injection neglected). Aggregated with the combustion CO2 emission advantages of solely 3.5 g·km−1 (Figure 4), recent diesel cars in Europe theoretically exhibit a climate advantage of 4 g CO2 equivalents km−1 . We however believe that the mere extra well-to-tank CO2 emissions caused by the strong demand for this type of fuel most likely overcompensates this minor aggregate emission advantage of modern diesel cars in real-life situations. Moreover, the above estimate is true only for new cars with properly working particle filtration system. A certain share of cars however develops technical defects over time in the particle filtration system. Then, those systems have a certain life expectancy rarely extending beyond 200,000 km resulting in higher mean PM emissions. The incentive of high mileage car owners to replace expensive filtration systems will be marginal. Besides, the diesel scenario strongly shifts towards the negative when the radiative effect over a short time - 20 years instead of 100 years - is considered. The CO2 equivalent effect of BC emitted by diesel cars is then tripled (see above). Even worse, recent global BC radiative effect quantification seems to be even higher than assumed by Jacobson which would further increase above presented figures of an additional radiative effect of diesel car BC emissions in terms of CO2 equivalents. We therefore estimate the aggregate climate effect of the general European powertrain switch from petrol to diesel to be negative accordingly, mainly due to the strong radiation effect of large numbers of diesel cars without particulate filter registered in Europe after 1995. Moreover, we would like to draw attention to the fact that in the developing world, some countries (such as India) continue to register large numbers of diesel cars without particle filter systems. The most effective strategy in minimizing global warming consists of increasing the ratio of electric hybrid petrol-fuelled cars or, under certain circumstances, electric cars. Furthermore, European citizens have been exposed to additional toxic emissions due to less stringent diesel car emission thresholds than applied to petrol cars for some 20 years. This holds true as well for many developing countries where less stringent European diesel emission standards are being applied with a time lag. India is a case in point. According to the WHO, NO2, ozone and PM are among the primary air contaminants threatening human health. WHO is the leading organization in quantifying and evaluating adverse health effects resulting in air quality guidelines. In Europe, WHO points to traffic-borne NO2, excess ozone and particulate matter values to some extent above dangerous levels and resulting in hundreds of thousands of premature deaths in Europe just in terms of PM. As for NO x , e.g. empirical research in California and Leicestershire, UK has shown that childhood asthma and exposure to traffic-borne nitrogen dioxide clearly correlates. Analogously to PM thresholds for passenger cars, EU authorities adopted different NO x emission thresholds for diesel than for petrol cars. NO x represents the sum of NO plus NO2. Since Euro 3 and up to now (Euro 5), NO x emission thresholds for diesel cars have been about three times higher than for petrol cars. Noticeably, this legal threshold limit between petrol and diesel cars (factor of 3) is mistakenly used as a basis for emission comparison even in high-quality scientific reports (e.g. by). NO x emission levels as reported by the different EU Member State using the New European Driving Cycle reveal a large gap between diesel and petrol vehicles: Euro 3 to 6 diesels are specified to emit 400, 200, 150, and 50 mg NO x km−1, which is about the 10-fold quantity than what petrol cars emit (data starting 2001,). As a result of catalytic converters, NO x emissions from petrol cars have been less than 45 mg NO x km−1 since 2001 respectively less than 30 mg NO x km−1 since 2005. Based on this assumption of a 10:1 NO x ratio of diesel to petrol car emissions, Helmers deduced that just the additionally registered diesel cars in Germany between 1995 and 2007 emitted 3% to 5% of traffic-related NO x emissions, amounting to 1.5% of aggregate NO x emissions by 2007 in Germany. Moreover, T. Buetler (Swiss EMPA) quantified diesel car NO x emissions under dynamometer conditions and concluded that current European NO x emission thresholds are exceeded under the New European Driving Cycle conditions on some vehicles with medium mileage (T Buetler, personal communication). We may conclude that emission levels as recorded by the New European Driving Cycle are not being met. However, there is more than that. Strong evidence suggests that under real-life driving, NO x emissions of diesels largely exceed threshold limits: a multitude of data was recently published, exhibiting much higher real-life NO x emissions (e.g. claims two-to-fourfold higher real-life NO x emissions). Outside the laboratory, only marginal NO x emission reductions were recorded over the last 10 years, i.e. from 650 (Euro 0) to 560 mg NO x km−1 (Euro 5) due to Scholz. Measurements of the European Joint Research Center point to real-life NO x emissions of Euro 5 diesel cars about 4 times higher than threshold limits suggest. Steven recorded values as high as 4000 mg NO x km−1 on present-day diesel cars in urban driving conditions with a high share of uphill rides within the city of Stuttgart (Southwest Germany). He concludes that even under a forthcoming Euro 6 threshold regime, the EU NO2 air quality threshold of 40 μg·m−3 for ambient air valid since January 1, 2010 cannot be met for the discrepancy between standardized cycle and real street emissions. Hagman et al. mention that ‘new cars with diesel engines may emit 500 to 1,500 mg NO x km−1, which is 20 to 40 times more than a similarly sized petrol engine car. New heavy-duty vehicles with diesel engines emit 4,000 to 10,000 mg NO x km−1. They particularly object that diesel car NO2 emissions have continuously increased since Euro 0 peaking at 450 mg NO2 km−1 for Euro 4 diesel cars and 350 mg NO2 km−1 for Euro 5 diesel cars. Under urban and highway driving conditions, Hagman et al. expect 45 to 55 mg NO2 km−1, which is still in the order of the NO2 emissions of Euro 0 to Euro 2 diesel cars while under congested conditions, they expect not less than 100 mg NO2 km−1 for Euro 6 diesel cars. These data easily explain why people are irritated by the chlorine-like pungent odour of NO2 emitted by modern diesel cars. Lemaire points out that within diesel exhaust emissions, control strategies of NO2 was apparently ‘forgotten as separate component of the NO x emissions from diesel vehicles’ resulting in increased NO2 and ozone pollution in a number of European cities. It is worth recalling that Japanese petrol-electric hybrid technology managed to effectively reduce CO2 emissions of passenger cars enabling even lower NO x emissions in the magnitude of 6 mg NO x km−1 (cf.). In comparison, petrol-fuelled cars emit under real-life situations 10 to 100 mg NO x km−1 as reviewed by Helmers. In conclusion, NO x emissions from current on-road diesel cars are 10 to 100 times higher than petrol car NO x emissions if petrol-fuelled hybrid cars are considered. Currently, European car manufacturers mind supplementary NO x cleaning technology costs required to comply with Euro 6 emission standards while simultaneously exporting ‘clean diesels’ overseas (USA basically). As a consequence, NO2 pollution levels have increased in those European countries with a high diesel car share, yet even in heavy traffic hot spots in moderately dieselized Germany, 34% of 489 measuring stations record NO2 mean pollution levels above the European Union threshold of 40 μg·m−3 in 2010. Due to the city of Stuttgart's setting in a valley inhibiting air exchange, nitrogen oxide records persistently exceed the EU annual threshold. In the city of Luxembourg, Europe's diesel car capital, annual mean NO2 concentrations have increased continuously from 46 to 60 μg m−3 since 1996. Paris, London and Florence are also among the highest NO2 pollution sites in Europe. With the estimated extra 45 million newly registered diesel engines in the European Union since 1995 emitting at least the tenfold amount of NO x as the engines they substituted, the EU is struggling to come to terms with the Gothenburg multi-component protocol. This protocol signed in 1999 is part of the stepwise process of the Convention on Long-Range Transboundary Air Pollution and aims at protecting health and ecosystems. It became effective in 2005 and compels Member States to effectively reduce SO2, NO x , VOC and NH3 emissions. The EEA and the European Member States follow these obligations by modelling their individual emission targets. However, national emission ceilings laid down in European Commission's Directive status reports are not based on actual recorded pollution but on computed theoretical modelling such as e.g. TREMOVE, TREMOD or COPERT. Modelling of toxic traffic emissions may thus be based on overall national fuel consumption. Even that, any model acknowledges to comprise potential errors - e.g. TREMOVE considers these to be 17% to 19% of computed NO x emissions - we believe those to be much larger since models are based on artificial laboratory-based emissions of cars (see above) while empirical and real-world measurements reveal that diesel car on-road NO x emissions are up to 20 times higher. Lemaire also points to numerous robust NO x immission underestimations ascribed to modelling. Despite underestimations, some states have been identified to exceed their NO x emission quota granted by the Gothenburg protocol. NO x emission exceedances and fleet dieselization rates of EEA Member States have been displayed in Figure 3. Even though non-traffic-related NO x can make up half of the aggregate NO x emissions in most countries, a prominent clustering of countries with both highest NO x threshold value exceedances and highest share of diesel cars in their fleets is observed (Figure 3). Luxembourg, the most dieselized European Member state, exceeds the allowed NO x emission quota by even 87% which is however partly explained by its ‘fuel tourism’ export policy. High NO x emissions of Ireland are related to the outstanding increase of car registrations. Available data on diesel car NO x emissions in Europe thus raises the question whether EU authorities are not able to sufficiently keep control in this field. We believe poor data causing considerable and persistent underestimation of actual diesel car NO x emissions to be the cause. In addition, the European public is hardly aware of the actual NO x immission situation: generally, modelled data computed with artificial data demonstrate (drastic) future emission reductions dominate the public view. While mean national (modelled) NO x levels are rarely exceeded, many European cities increasingly experience NO2 pollution levels above the EU threshold of 40 mg·m−3 in reality. In June 2012, WHO's International Agency for Research on Cancer classified diesel engine exhaust as carcinogenic to humans (group 1) based on ‘sufficient evidence that exposure is associated with an increased risk for lung cancer’ after it was classified as probably carcinogenic to humans (group 2A) in 1988. Gasoline exhaust has remained to be classified as ‘possibly carcinogenic to humans’ (group 2B) since 1989. WHO has thus criticized the shift from gasoline to diesel vehicles commended by the IPCC focusing merely on alleged CO2 emission reductions. In the Netherlands, particulates have been classified as the second highest risk for human life. Wichmann reviewed that average life exposure to particulates (23.5 μg PM10 m−3) reduces life expectancy by 0.6 years. Moreover, 1% to 2% of annual fatal casualties can be attributed to diesel vehicle emissions in Germany. The equipment of all diesel cars with particulate filters would prolong life expectancy in Germany by 1.9 months. It has been claimed that the diesel particulate filter retains most of the particulates. While this is true in terms of mass (weight basis), it does not hold in terms of number concentration as particulate filters may emit nanoparticles in much larger numbers than without filtering. Moreover, modern diesel engine technology has caused the number concentration of nanoparticles to increase. We wish to recall that probably a majority of diesel cars with modern engine technology registered in Europe since 1995 - with a life span beyond 15 years (see above) - have not been equipped with a particulate filter trap. Health costs for excess direct CO2 emissions may as well be quantified (e.g.). However, we are not going to compare CO2 and toxic emissions health costs in this paper, which is a complex but important question. We have to point out all the more that due to the European diesel car boom, citizens in Europe have been exposed to excessive toxic emissions and associated health costs while the climate could not benefit. The European Commission has unilaterally promoted diesel car technology evidenced by higher toxic emission threshold legislation since 1996 (Euro 2). We believe this is a violation of the principles of a sustainable society as defined in 1991 by IUCN, UNEP and WWF. If the environmental record of a proliferation of diesel cars in Europe is as unsatisfactory as portrayed, the question then arises about how this paradigm switch originally came to be and has remained in force for more than 15 years. Europe was confronted with shrinking fuel oil markets from 1970 onwards and more dramatically, after 1979, clearly reflected by oil company BP sales data 1965 to 2011 which specifies the quantities of the crude oil distillation products, light distillates (gasoline, petrol), middle distillates (diesel) and fuel oil (which can be converted to diesel) sold for Europe. The reasons for the lack of demand for middle distillates were at the least twofold. First, natural gas had increasingly pushed out fuel oil as a heating fuel at the continental European market since the mid 1960s. In Germany, 18.6 million (48%) households were connected to natural gas networks by 2009 (http://www.statistica.com, 2012). Then, in the 1960s in France, General de Gaulle's thrust to make nuclear the key to energy independence meant closing old power plants fuelled with middle distillates. Some experts believe that just the need of the European oil refinery industry to place the excess fuel oil on domestic markets made the powertrain paradigm shift to diesel cars happen (for Germany; for France J. Lemaire, 2012, personal communication). Deputy mayor of Paris Denis Baupin argues that Peugeot was encouraged to massively produce diesel cars in order to get rid of diesel oil overproduction. We believe the European oil industry co-initiated the shift to diesel cars in the 1980s and 1990s in order to find outlets for middle distillates. Even though the outstanding diesel car boom has nowadays resulted in diesel fuel demand above the ‘natural cap’ provided by the average composition of raw oil, the oil company ARAL expresses the need of diesel fuel outlet clearly: ‘Combined production requires the sale of certain amounts of gasoline and middle distillates. Since fuel oil sales are declining, this share has to be marketed as diesel after appropriate conversion’ (translated from German,). Not coincidentally, the oil industry, automobile industry and European Commission have been the main players in predetermining the development of European automobile market through the Auto-Oil I and II programs (concluded in 1996 and finalized by October 2000,). The first steps of rule-making in climate policy at a European scale have been made in the 1990s. After a slow progress in tightening the regulatory framework of greenhouse gas emissions, the agreement reached at Kyoto in December 1997 finally triggered of a voluntary fuel economy agreement between the European automobile manufacturers and the European Commission. We believe that this agreement and preceding negotiations initiated the European diesel car boom, as reflected in the continuous increase in diesel car sales since the mid 1990 years (Figure 1). The voluntary character of the agreement was based on a new ‘let's work together approach’, implying a ‘reinforcement of the dialogue with industry and the encouragement, in appropriate circumstances, of voluntary agreements and other forms of self-regulation’. It has been argued that the agreement diluted and postponed environmentally effective climate regulation. It was an inappropriate policy instrument to use for regulating CO2 particularly as the European Union's commitment to the UNFCC Kyoto Protocol was binding. The reasons why voluntary instead of binding measures were chosen are manifold. First of all, the voluntary agreement was able to break the deadlock after many years of difficult negotiations in EU climate policy negotiations. As a lowest common denominator outcome, industry favoured such an approach as it promised to be less demanding than conventional policy measures. The Commission took advantage of the voluntary attribute, since binding environmental policies stipulated co-decision of the European Parliament and the Council according to the Maastricht Treaties. The resort to a voluntary agreement has been in line with the neo-liberal paradigm change where governance has been increasingly characterized by flexible, market-based and non-regulatory policy instruments. This multi-level governance approach becoming prominent in the 1990s further weakened the EU Commission based on multi-national governance contained by subsidiarity rules and being more often than not merely a policy advisor than a policy maker. Voluntary arrangements also mirror a particular European-style governance. High level of communication and lobbying activities between the car industry and political decision makers succeeded in shaping European and national policy design that served to replace effective climate regulation. The agreement was negotiated largely without public participation. The cooperative procedure between limited stakeholders with high willingness to compromise largely precludes the possibility of technology leaps and results in remaining in a business-as-usual trajectory, the largest shortcoming of the European model of regulation. The European style of policymaking fundamentally diverges from the US model which shows a preference for command-and-control measures with ‘technology-forcing’ features. The latter unfolds in a competitive and politically more conflicting environment. It merits to have initiated remarkable technology leaps, i.e. the three-way catalyst or the electric car (cf.). ‘Technology-forcing’ type of regulation is considered to be non-transferable to a European Union setting due to multi-level decision-making processes with institutions having comparatively low bargaining power and a long-standing governance mode inclined to concertation and search for consensus. While the Commission believed that the voluntary approach offered greater flexibility to manufacturers and performance-based standards avoided dictating technology, the contrary has happened. As Keay-Bright argues, the voluntary agreement was a good example of regulatory capture. The fuel economy target was solely to be achieved by technology-based standards without targeting any technology beyond business-as-usual. As such, it did little to support alternative powertrains and relied heavily on direct injection diesel and gasoline technology. The ACEA commitment was thus straightforward: ‘European car manufacturers have high expectations for (…) direct injected gasoline and diesel engines, which are two of the most promising routes to achieve the central commitment of 140 g CO2 km−1 in 2008’. Even that the terms of the commitment were designed to assist both the maintenance of petrol and diesel internal combustion engine technology, ‘ACEA raised uncertainties associated with the introduction of gasoline direct injection technology. This technology was supposed to break the strong trend towards diesel-powered passenger cars’. Accordingly, series production of passenger cars with common rail direct injection started earlier (e.g. by Daimler in 1997) than competing petrol cars with direct injection technology which entered the market much later (e.g. VW in 2005, Ford in 2012). The Commission had granted the automobile industry major concessions through the terms of the agreement. It may also be ascribed to a Commission which lacked expertise and which had not conducted any technical studies of its own about CO2 abatement strategies and its costs for industry. European automobile manufacturers could thus make profitable their investments in diesel direct injection technology. They ‘in fact dictated the technological development of the automobile industry through the establishment of certain terms for the agreement’. Moreover, the European Union also agreed to introduce legislation on emission standards which deviated from the principle of fuel-type neutrality. Indeed, while in 1992/1993 NO x + HC thresholds were at the same level for any of both major fuels (Euro 1), 4 years later when Euro 2 legislation entered into force, the European Union granted more lenient emission standards for diesel than for petrol. From then on, diesel vehicles could emit 40% more NO x + HC than petrol ones. The deliberate compliance of higher threshold values of pollution to one fuel type must be interpreted as a politically motivated measure to promote growing dieselization. In all the following stages of standardization, higher emission standards were granted to diesel fuel. This leniency for diesel vehicles contrasts with legislation in the United States, which is ‘fuel-neutral’ (quoted in). European Commission vice-president Günter Verheugen, responsible for enterprise and industry policy, however stressed when the more lenient Euro 5 regulation was going to be introduced: ‘It will not hamper the competitiveness of the EU's car industry’ (quoted in). Whereas the profitability of the car industry declined during the 1990s resulting in over-capacity of production, the advent of common-rail injection systems became a great opportunity for European automakers at the end of the decade. Diesel car performance improved significantly and its demand was boosted in Europe. Car suppliers and manufacturers, especially those with a market leadership in diesel like VW and PSA could reap major benefits while most car manufacturers' petrol-engine capacity sat idle. The real challenge consisted in conquering overseas markets. The US market with its more stringent environmental legislation was at stake. European automakers had to make sure to comply with future US exhaust regulations. If they were not able to meet them, gasoline hybrid technology led by the Japanese was to become the dominant alternative powertrain in the USA. The European diesel versus Japanese hybrid technology debate produced strange effects. In 2003, Toyota was excluded from talks between ACEA and the European Commission over Euro 5 emission laws due in 2010. The stance of Japanese carmakers was not appreciated with their European counterparts since they considered diesels to be a dead-end technology environmentally: ‘When equipped with all future after-treatment equipment, diesel cars will become as expensive as hybrid cars’, says Katsuhiko Hirose, hybrid project general manager for Toyota. European Union emission legislation however remained more lenient and did not require or simply postponed the need for after-treatment equipment. Dated technology could therefore be artificially kept alive. We believe that this conduct contradicted the self-imposed ‘best available technology’ legislation laid down by the EU stating that ‘emission limit values, parameters or equivalent technical measures should be based on the best available techniques’. Volkswagen, Renault, PSA/Peugeot-Citroen and DaimlerChrysler alleged not to believe in hybrids. We think that the very successful marketing of diesel cars by European automakers made them blind for more progressive and challenging technological developments. Hybrid technology necessitates the command and integration of both electric and combustion engine involving high investments. European automakers were able to defer these costs in the long term by holding on to the profitable diesel path. While Japanese automakers offered series produced hybrid models as of 1997, the first European-produced hybrid was a double-priced Mercedes in 2009 as compared to Toyota Prius. European carmakers however admitted slowly but surely that diesel technology was not to be a long-term solution. While diesel technology was expected to lower CO2-emission levels, it could not meet future nitrogen oxide emission rules. Volkswagen Group CEO Bernd Pischetsrieder put it this way: ‘Diesel cars will not be abolished. They will however only survive in large cars.’ The high cost of tailpipe emission treatment could only be internalized in more expensive segments of the car market. In the boom years of the European diesel car proliferation following the voluntary agreement's coming into effect in 1998, European legislation did not only refrain from giving adequate attention to toxic emissions but was literally constrained by the agreement to do so. If Member States were to introduce fiscal measures to address, for example, noise or adverse health effects, such measures could be regarded as discriminatory against the technologies which ACEA had chosen to promote. The strategy of the voluntary agreement was three-pillared. Next to the main supply-side measures to reduce car CO2 emissions, an additional 10% emission reduction was to be achieved through a labelling scheme and car-related fiscal measures to influence consumer demand. When the voluntary agreement was verbalized, ACEA President Pischetsrieder initially called for ‘no negative measures against diesel-fuelled cars’ (interview, in). The Commission finally agreed to include in the text a vague reference to ‘unhampered diffusion’ of CO2-efficient technologies in order to cater for ACEA's concerns regarding fiscal measures. As Kågeson asserts, this wording served to replace ACEA's condition in an earlier outline proposal that ‘no negative measures against diesel-fuelled cars’ should be taken. Moreover, the Commission bowed to ACEA pressure and agreed to review the commitment ‘under certain circumstances’ should fiscal measures interfere with the particular fuel-efficient technologies which the manufacturers were trying to promote ( in). Just a couple months after the voluntary agreement was signed, Pischetsrieder referred to this matter and made clear that ‘although we do not question the right of the Community and its Member States to exercise their prerogatives in the field of fiscal policy’, changing the structure of vehicle taxation ‘could have serious consequences for the competitiveness of the industry and the employment in the sector’. Member States were initially slow to adopt CO2-based fiscal measures. In 2002, only the UK and the Netherlands had adopted measures to align car taxes along CO2 emissions. By then, the share of diesel cars had increased incessantly not alone due to persistently lower taxation of diesel fuel granted by most Member States but by European consumers appreciating diesel driving style and torque. A further increase of dieselization beyond the ‘natural cap’ provided by the average composition of raw oil (about 40%) could however fuel anti-diesel initiatives and become problematic for the automobile industry. ACEA's negative stance towards Member States' adoption of CO2-based car taxation was thus tempered. In 2008, ACEA solely expressed concerns regarding the lack of fiscal harmonization which would have distorting effects on the internal market. Fourteen Member States had adopted CO2-based taxes on passenger cars by then. ‘There is a lesser degree of environmental cost coverage for diesel than for petrol because the current requirements for nitrogen oxide emissions per kilometre for new diesel cars are significantly less stringent than those for petrol cars. Diesel engines also emit significantly higher amounts of particulates than petrol engines. On the other hand, diesel cars emit significantly less CO2 km−1 because of their lower fuel consumption than petrol cars. Therefore, according to criteria used to assess the impact on the environment (gas and particulate emissions, noise), there would be no reason for taxing differently diesel fuel and petrol consumed by passenger vehicles. A reasonable balance would mean both being taxed at broadly similar rates’. With the only exception of the UK, all other Member States apply lower tax levels on diesel fuel. However, due to the need for unanimous agreement in the Council of Ministers, a fiscal alignment remained highly unlikely. The European Commission can only encourage Member States to align fuel taxes according to their CO2 content. Some countries however resisted such recommendations and have kept tax rates low in order to attract fiscal revenue by so-called ‘fuel tourism’ of road hauliers. In addition, the European Parliament had rejected the proposal on grounds that a higher taxation of Diesel fuel would have significant repercussions on the automobile industry which possessed a competitive advantage in this technology (report from Piia-Noora Kauppi, A5-0383/2003, German text). The Green Group in the European Parliament was the only group to support, in principle, the Commission's proposal. We believe that ACEA felt confident to continue counting on low diesel fuel taxes even the association had less of a hold on those non-car-related taxes. Hence, the ill-advised unilateral focus of European regulation on CO2 with low emphasis on toxic emissions as compared to US or Japanese legislation cannot be blamed alone at stakeholders at the European level. The European Commission launched another attempt to align fuel taxes in 2011. With the revision of the Energy Taxation Directive, the Commission's proposal again was to tax fuels in a neutral way and to ensure a fair competition in the internal market. All fuels would compete on the basis of their carbon content instead of tax advantages. Even the proposal expressively ‘did not seek to penalize diesel but to tax fuels in a neutral way on the basis of their merits instead of tax advantages’ (EU Taxation Commissioner Algirdas Šemeta in), it resulted in shifting the litre price level of diesel above the petrol price level according to the higher energy content of the former. Very generous transitional periods until 2023 were thus scheduled to make such a move acceptable. However, still the proposal was going to meet strong resistance in the European Parliament and in different Member States. As described above, the third pillar of the voluntary agreement aimed at introducing car-related fiscal measures to influence consumer demand. Due to subsidiarity rules, the European Commission could however only stimulate Member States to follow its recommendations, which consisted in taxing transport fuels equally according their CO2 content. Numerous national tax systems in Europe positively discriminated diesel fuel and, to a lesser degree, diesel-driven vehicles long before EU rulemaking in climate policy started off. At the end of the eighties, there was a need not to jeopardize the economic and financial balance of the road haulage sector which accounted for most of the diesel fuel consumed. At that time, a very small proportion of private cars (15%) used diesel fuel. The amount they consumed was therefore marginal (about 10% of total sales of diesel fuel) CEC. Triggered off by subsidized taxation of diesel vehicles and fuel, the European car industry could invest into this type of powertrain with extraordinary commitment. As a result, the rate of diesel cars on Europe's roads had increased greatly by the end of the 1990s. Mayeres and Proost ‘fail to see the rationale for a more advantageous treatment of diesel cars’ in most European countries. Burguillo-Cuesta et al. wonder that available literature on the transport sector's energy demand has paid little attention to this issue considering that the outcome of this preferential treatment amounts to ‘a socio-economic phenomenon that deserves to be analyzed’. As costs of driving have declined, the so-called ‘rebound effect’ makes people take advantage of the ‘saved money’ by driving diesel-powered cars more and with larger and more powerful vehicles. This phenomenon is meanwhile believed to make up a bigger share of environmental consequences of dieselization than the technical features of diesel cars. The more the aggregate tax level of driving is lower for a diesel car than for a petrol one, the higher diesel penetration would be and so would be the rebound effect, yet our thrust here is not this apparent correlation but a question of political economy, i.e. to track the reasons why aggregate diesel taxation not only varies greatly among developed world regions such as the EU, USA and Japan but also varies strongly within Europe. Among aggregate taxation, we understand the sum of car-related taxation, such as registration and circulation tax plus the fuel tax and so do tax incentives vary greatly, based on a multitude of threshold values and performance criteria. The EU CARS 21 High Level Group on the Competitiveness and Sustainable Growth of the Automotive Industry objects that this multitude would lead to a fragmentation of the internal market and would therefore require greater coordination of the incentives. We wish to analyze the varying degree of dieselization within several European states along four assumptions. We consider the dieselization level directly related to aggregate diesel taxation rates, which has been acknowledged by the European Commission. Firstly, diesel cars are treated more advantageously in those countries which have an automobile or supplier industry with a strong stake in diesel technology. We believe that safeguarding employment in the automobile sector has been an important momentum to open up market shares for diesel cars. Secondly, a strong bias towards ecological modernization curbs the tendency to treat diesel cars more advantageously than petrol cars. We assume that advanced ecological modernization checked by a participative civil society will have a positive effect on environmental policy formulation, thus restraining dieselization. Thirdly, diesel cars are treated more advantageously in countries with a ‘corporatist’ type of governance, i.e. where the state has preferential relations with industry. We use here a wider definition of corporatism including ‘corporatist without labour’ to include the French model of state-led capitalism). Lastly, small states with a lot of potential transit traffic tend to tax diesel fuel at low levels. The reason here is to maximize aggregate fuel tax collection (the so-called ‘fuel tourism’ effect). 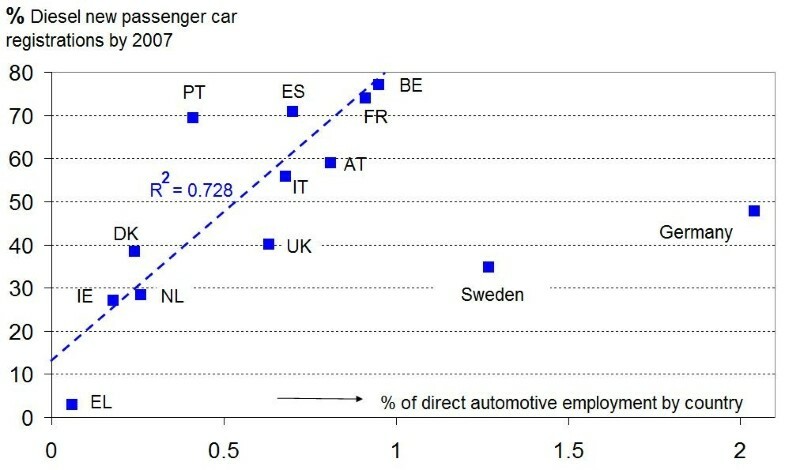 As for the first assumption, we have plotted in Figure 5 the share of newly registered diesel cars in 2007 to direct automotive employment in 13 EU countries. The year 2007 was chosen because it was prior to the worldwide recession in 2008/2009 largely influencing car sales. Dieselization rate versus automotive employment. Share of diesel car registration, automotive employment. The numbers of employees were recalculated to the share of direct automotive employment by country with data from Eurostat and from Nomisweb regarding the United Kingdom as well as from Anell regarding Sweden, respectively. IE, Ireland; EL, Greece. The coefficient of determination R2 and regression line have been calculated excluding Sweden and Germany. Excluding two outliers, we find a surprisingly high correlation between dieselization and employment in the automobile industry. Both Swedish and particularly German dieselization rates are delinked from relative automotive employment. We find high to very high automotive employment and export-led production in both Germany and Sweden. Dieselization can therefore only be marginally attributed to safeguarding employment in these countries. The second assumption takes ecological modernization into account. We assume that strong performance in comparative ecological modernization has positive effects on environmental policy formulation and consequently curbs the tendency to tax diesel cars and fuel more advantageously than petrol cars. European countries scoring best on the index of Scruggs are Germany, Switzerland, Austria and the Netherlands while for the remaining field, there is a sloping tendency from North to South, apart from the UK which scores rather low. It is worth mentioning that Germany takes a leading role in ecological modernization (see also) while at the same time, automobile production is outstanding and the comparative employment in this sector is very high. Germany hosts several lead developers of diesel technology (BMW, Volkswagen, Daimler), yet unlike in other manufacturing countries which peak in Diesel technology, aggregate tax incentives for diesel have only been moderate with a resulting dieselization below the European mean (Figure 2, cf. also). Lower diesel fuel prices are balanced by a moderate car tax penalty for diesel cars. The penalty was however lowered when in 2009 automobile tax was modified to become contingent on CO2 emissions. Promptly, diesel car sales were fuelled reaching a record high of 48.1% in 2012. Howsoever, civil society has an eye on air pollution control more than in most other countries. Public discourse on issues of urban particulate matters pollution has been particularly animated in the early 2000s before the particulate filter was introduced. The critical debate on diesel ceased however after almost all new diesel cars were equipped with filters. Excess NO x emissions of diesel cars have not been a major issue of debate in the general public, not even after NO x levels in many German cities exceeded EU threshold levels. The Netherlands is a case in point for efficient policy making. Whereas we find here one of the largest differentials between (high) petrol and (low) diesel taxation, the ratio of Diesel to petrol cars is surprisingly low. Several reasons may serve to explain this low dieselization. In this very densely populated country, inhabitants are comparatively receptive to environmental issues. This concern about air quality may be a crucial reason why Dutch chose to keep dieselization low. However, a long-standing reliance on national gas for heating and transportation purposes and a domestic refinery sector with higher output of light distillates than middle distillates may also elucidate why high ‘deterrence taxes’ for diesel cars are prominent in the Netherlands. A Dutch policy paper on traffic and transport emissions stated that it is not desirable for the diesel share in new passenger car sales to increase for air pollution concerns. The third national environmental policy plan (1998) targeted to reduce the diesel share of new passenger car sales from 11% in 1998 to only 5% in 2010 (G Geilenkirchen, personal communication). Dutch registration and circulation taxes for Diesel cars are close to prohibitive unless cars are driven a high mileage. Whereas the annual circulation tax for a gasoline car is approximately 600 €, it is double for a diesel car. Moreover, registration taxes have been 1868 € higher for diesel cars than for petrol cars. This tax is currently being transformed to a CO2-dependent tax, but a compensatory diesel penalty will persist. As a result of the fiscal policies, the share of diesel cars in the Netherlands has been much lower than the EU-average, varying between 20% and 30% (G Geilenkirchen, personal communication). The situation in neighbouring Belgium is very different. The share of Diesel cars in Belgium has been high for many years and is still growing. Between 2000 and 2010 it increased from 40% to about 61% (Figure 3). Important distortions of the Belgian fiscal system are related to the taxation of diesel cars which make diesel cars pay some 50% less fuel taxes per km than gasoline cars[115, 126]. As such, diesel cars have been dubbed as ‘cash cows’ - cars which generate cash and are ‘milked’ continuously with as little investment as possible. The Belgian case is also revealing for the different approaches the regional Flemish, Brussels-capital and Walloon governments are taking. As of January 2011, car tax collection has become subject to the regions of Belgium. In 2012, the densely populated Flemish region has introduced a new vehicle taxation system based on the environmental performance of vehicles. Apart from CO2 emissions, it takes the type of powertrain and the EURO car emission standard into account. Prior to the reformulation, research efforts have been focused on setting up a rating tool, the so-called Ecoscore, a well-to-wheel life cycle analysis which calculates for every individual car the impact of several damage categories such as climate change, health-impairing effects, effects on ecosystems and noise pollution. Concerns about diesel air pollution and the loss of lifetime due to the exposure to air particulate matters have been much more noticeable in Flanders and Brussels than in the rural Walloon region. In the latter region, a CO2-dependent bonus-malus registration tax encourages the purchase of low CO2-emission cars, whatever their fuel type. The higher air pollution impact of diesel cars is not taken into account. It may be argued that the different perception is due to the strong urban-rural bias between the Flemish and the Walloon communities; however, we would not repudiate a stronger ecological consciousness of Dutch-speaking Flanders to be linked to the ecologically more modernized Netherlands. On the contrary, it is striking how the indifference of the Walloon region's legislation on air pollution mirrors the legislative landscape in France. In France, the only car taxation in force over the last decade has been an ‘ecological’ bonus-malus registration tax. It has largely succeeded to improve fuel economy of newly registered cars yet at a high fiscal cost and without taking PM and NO x pollution into account. France was the first European country in which diesel cars became more popular than petrol cars and has been regarded as an interesting case study of the overall impacts of dieselization with rapidly expanding sales already after 1982. Concerns about air pollution by diesel fumes have largely been absent due to a relatively low level of environmental awareness in France and a ‘weak role played by environmental groups’. On the other side, we find a rather strong automotive manufacturing sector with one of the lead developers for diesel engines (PSA). Our third assumption is embedded in the active and dirigiste role of the French state. A cooperative and non-adversarial atmosphere of policymaking between government and business taking place behind closed doors and the belief that ‘market forces do not necessarily produce a socially optimal outcome without the close supervision of the state’ has left much leeway for politics to steer broader issues of the political economy. In the context of private transport, the car manufacturer Peugeot obtained in 1985 governmental assurance of lower taxes on diesel before going ahead with a long-term strategy of substituting petrol with diesel engines (Zmirou, Denis in). By the mid-1990s, Peugeot was the world's biggest producer of diesel cars. The French government tried to slow increasing dieselization twice. In 1989, the Ministry of Industry was preparing a reform of the energy pricing policy that called for hiking taxes on diesel fuel. The ministry argued that the tax gap between petrol and diesel was encouraging, ‘excessive development’ of diesel-powered cars in France, reaching 23.9% of new car sales in 1990. The hidden agenda behind was that demand for diesel fuel was outrunning the production capacity of French refineries, thereby obliging France to import diesel fuel. But the proposal was leaked to the press and the haulage sector erupted in protest. The government quickly repealed the plan. By the end of the 1990s, Dominique Voynet, France's Green environment minister, tried to pass substantial tax increases on diesel. However, her success has been minimal, although diesel taxes were raised slightly while taxes on gasoline stayed stable for the first time. Let us now have a brief look at Europe's geographical extremes in the North-West and South-East revealing some peculiar phenomena of dieselization growth. Norway used to have a ratio of new diesel car registrations of less than 10% until the turn of the millennium. By 2005, figures began to rise very fast and reached a peak in 2007 with 74.4% diesel share. In 2007, the Norwegian government had restructured vehicle taxation by introducing CO2 emissions as one of the main components of the tax. In conjunction with low diesel fuel taxation, this policy measure was the key trigger for the strong surge in the purchase ratio of diesel cars. Consequently, emissions of NO2 in major Norwegian cities have increased largely. The Norwegian Institute of Transport Economics recently deemed appropriate to possibly limit the use of diesel vehicles in cities when NO2 concentrations are highest. New fiscal policies have already been adopted, adding a NO x component to the tax ‘to address both global and local pollution’. The question arises why just 5 years ago, when regulators zealously encouraged diesel technology no other alternatives were envisaged to reduce CO2. Dryzek et al. uphold Norway to be an ecologically modernized state, however weak and of comparatively top-down the design. Even that environmentalists have been secured participation in crucial policy-making committees in core zones of the state, they are small in numbers, lack autonomy and activism, and greatly rely on the state for funding. Greece used to embody the absence of Diesel in Europe with the lowest EU-wide dieselization. A ban of vehicles with diesel engines in Athens and Thessaloniki imposed in 1991 has prevented a dieselization of Greece's car fleets. The measure was taken to reduce notorious Athens' air pollution and to limit the damage to ancient limestone buildings caused by acid deposition at the time of much higher NO x emissions of diesel cars. Greece has been the only Member State of the European Union to enforce such legislative measure knowing that some other cities particularly in Central and Eastern Europe suffer chronically from air pollution. Then in 2011, the Greek Ministry of Environment, Energy and Climate Change passed a new bill in Parliament concerning the lift of the circulation ban for diesel engine vehicles in the city of Athens and Thessaloniki. Combined with lower cost to run diesel vehicles, the repeal of the ban is expected to soundly stir the car market. Hesitations about an increase of NO x pollution levels have not gained prominence in public discourse. It has been pointed to nowadays apparently clean diesel technology. We draw the uncritical approach to weak ecological modernization which southern European countries are supposed to suffer from, usually attributed to the reactive character of environmental policy formulation and fragmented administrative structures. As for our fourth and last assumption, we find a group of small countries with low fuel taxation, particularly on diesel. Their rationale is not to maintain a competitive industry nor is ecological modernization at stake. The collection of fiscal revenue is crucial. Due to a fast internationalization of road freight transport and trucks that cover thousands of kilometres on a single tank of diesel, optimized refuelling strategies make road-haulier companies choose to fill up in those countries where diesel tax is lowest. Geographically, in between the above-covered countries, we find tiny Luxembourg with a large impact on dieselization beyond its borders. Its fuel taxes on diesel have been consistently low, just above the minimum EU level. According to the European NGO federation ‘Transport and Environment’, the loss of diesel sales in neighbouring countries by ‘fuel tourism’ may not seem to be disastrous, but it provides a political excuse for their regulators not to raise diesel taxes. Apart from Luxembourg, we find Austria and Slovenia keeping diesel tax low for such incentive. Table 2 summarizes the effect of the assumptions for several countries. Each country is scrutinized along all assumptions. The more any of the assumption holds true, the more stars are attributed with a minimum of 0 and a maximum of 3 stars. The degree of dieselization in each country can be read from the last column adding up the stars. Rating: 0 minimum, *** maximum. This paper has dealt with the process of the technological petrol to diesel powertrain paradigm shift which has taken place rather mutely in Europe for 2 decades. We have attempted to show that while the shift away from petrol-fuelled cars has become an absolute necessity in a world of climate change, the path taken by European stakeholders - both politics and industry - has rather shifted Europe further away from the stated objective: the diesel path did not manage to reduce heating up the planet when accounting not only for those emissions laid down in the Kyoto protocol (CO2) but for black carbon as well. On top of that, it has persistently exacerbated local pollution with regard to noise, nitrogen oxide and particulate matter. We investigated into how the unilateral positioning of European politics and industry on the diesel paradigm made this shift happen. A shift which prevents the continent from exploring alternative and more sustainable pathways such as hybridization and electrification as yet. The socio-economic consequences of current transport policies are rarely called upon. Diesel motion has reduced the cost of driving in Europe when considering inflation-corrected and sales-weighted average fuel prices and taxes over time. Car drivers have become accustomed to have an easy escape from high travel expenditures with diesel fuel more economic than petrol in a double way: one volumetric unit is both cheaper and of higher energy content. The momentum of long-standing preferential conduct by the state will not easily be turned around as the recent European Commission's proposal to harmonize fuel excise duties has revealed, yet not only private customers' inertia is at stake. Small Member States' budgets accustomed to reap wind-fall profits from the so-called ‘fuel tourism’ could not easily give up preferential diesel fuel policies. It will have to be seen whether imbalances in the world's fuel markets and more competitive powertrain strategies of other global players might in the end show European carmakers the way forward. MC and EH developed the study design, performed the research and drafted the manuscript. Both authors read and approved the final manuscript.